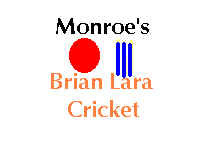 This website is dedicated to Brian Lara Cricket for the PC-CD ROM. This game is one of the best if not thee best Cicket game ever created and it will keep you enthrilled for may months to come. Click on the links and explore the site I hope you enjoy its contents! Check out: www.cricketgames.com for all the latest updates on any cricket game!